The announcement came on a winter’s night at the annual MUPS Holiday Theatre party. Eager students gathered to hear the new shows for Marquette Theatre’s 2017-2018 theater season announced from a scroll. It was their Christmas present, and a special one at that. The show titles were released to the public on March 21. 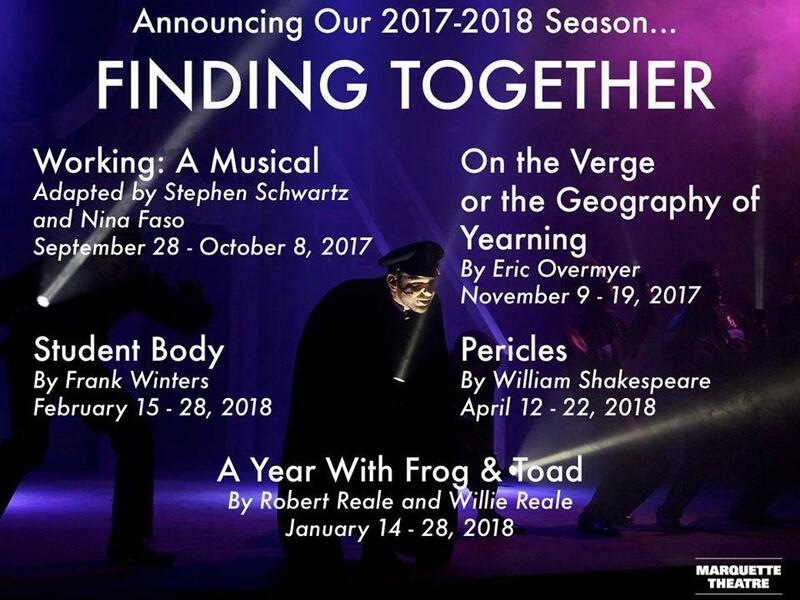 This upcoming season challenges the status quo by touching on a variety of topics, from sexual assault to women traveling through time and a Shakespearean adventure. Director Jamie Cheatham spoke about this upcoming season’s shows and expressed his delight to see them brought to life by student actors, designers and crew. In comparison to “Anything Goes,” this season’s musical that was in a traditional Broadway-style show, working has a slightly different flavor, according to Cheatham. “For a musical, it’s got a certain amount of grit,” Cheatham said. In this musical, three female Victorian explorers venture to a dark unknown territory. Cheatham described the story as a witty and clever comedy. To make the adventure even more peculiar, the three explorers also travel through time. Cheatham said they even find Cool Whip in the 1950s. The committee thought it was an important subject to cover and began looking for a script, but found it was much more difficult than expected to find a strong script that addressed the topic. They came across “Student Body,” and are excited about the potential of the show. “Each year we try to build additional programming around our social justice play to highlight the issues and continue the conversation,” Cheatham said. Opportunities may include guest lectures, talkbacks and events on campus to raise awareness. Pericles is Marquette Theatre’s classical play. The Theatre performs Shakespeare every other year. The show features shipwrecks, scandalous family secrets and perilous journeys. “Our theater for young audiences show is a push and pull story about a close friendship between a friendly frog and a crazy toad. They have differences that make their friendship work,” Cheatham said. The show is based on “Frog and Toad” children’s stories by Arnold Lobel. Aside from the two main characters, the show also features creatures such as a bird, mouse, squirrel, mole, turtle, snail and a lizard.